In the 1980s and ’90s, companies gained prestige by going global. Recently, globalization has come under fire from multiple fronts, causing the locally integrated business model to become the new goal for many companies. Pressure is coming from forces such as political rhetoric creating more trade barriers, consumers’ preference for personalized, local goods, and technological advances that change the dynamics of the basic business model, so companies must turn away from strategies that focus on globally integrated value chains and focus on thriving locally in each market that they serve, according to a study released in September by A.T. Kearney’s Global Business Policy Council. 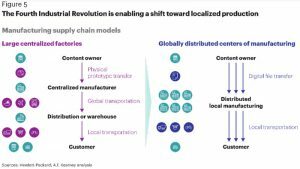 In order to thrive in the “Age of Multi-Localism” companies will have to go beyond decentralizing production to devolving such functions as management, operations, supply chain, production and marketing, the report said. Recognizing the trend, 89 percent of investors said their companies are in some stage of localization. About 40 percent are hiring local talent or setting up production in manufacturing facilities in local markets. 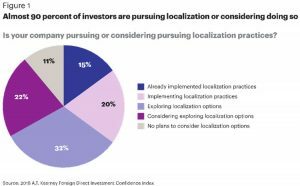 And about 33 percent are implementing localizing strategies that include product design, research and development, market entry through mergers and acquisitions or joint ventures, branding and marketing, and internal management. The report states that Brexit and the U.S. election of President Donald Trump show that anti-elite, anti-immigration and anti-globalization sentiments have been increasing in tandem with economic inequality, leading to the islandization of the global economy, offshoring of production and downward wage pressures, particularly for low-and mid-skilled workers in developed markets caused inequality to rise. According to the report, the world’s richest 1 percent owned 50 percent of total global wealth in 2017. Many governments that were previously working to eliminate barriers to trade are now increasingly erecting them. Policy pressure to localize is evident in a number of world events — the U.S. renunciation of the Trans-Pacific Partnership (TPP), the deepening row between the U.S. and China over trade, the rocky NAFTA talks before the recent USMCA deal, and French President Emmanuel Macron’s European Union efforts on free trade by advocating for protections of French products. The world’s 60 largest economies have put into place more than 60,000 trade barriers since the end of the Great Recession, the report said. There is a shift in patterns of consumption toward localized and personalized products. The report found that 70 percent of Americans thought that buying products made domestically was very or somewhat important, some consumers also expressed concern about the environmental impact of their purchases. The rise of e-commerce and now frictionless commerce — in which purchases happen seamlessly without the customer having to make a conscious decision — means that companies now need to give customers a reason to interrupt the automated purchasing process and actively choose their brand. Global companies that have adapted well to the market’s new demand for localization and personalization include McDonald’s , which has long tailored its menus to local tastes and customs (like not offering beef products in India and offering squid products in Japan); Unilever and Procter & Gamble that offered reduced packaging sizes for products in Asia and sub-Saharan Africa to meet consumer needs at a lower price point. Recently, Nestle has been purchasing more local and healthier food labels to offset a decline in some of its mass-market and globally recognized brands. Technological advances such as the internet, robotics, 3-D printing, and augmented and virtual reality are changing traditional business models, modes of communication and the structure of the global economy. 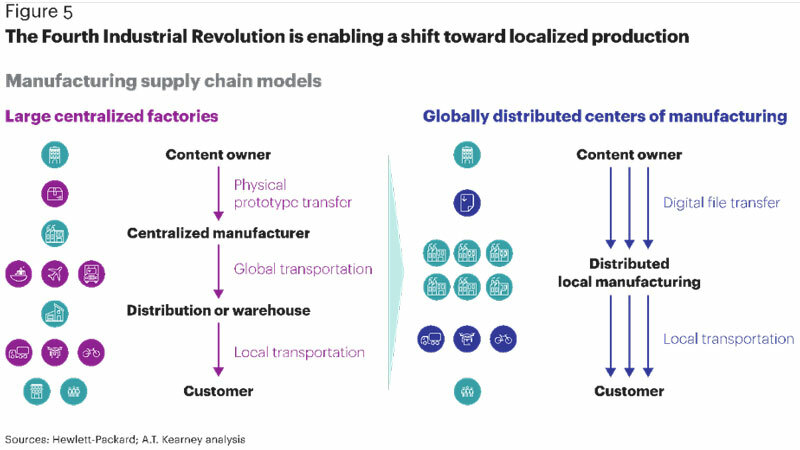 This transformation, known as the Fourth Industrial Revolution (4IR), will transform what, where and how products are designed, manufactured, assembled, distributed, consumed, serviced after purchase, discarded and reused. 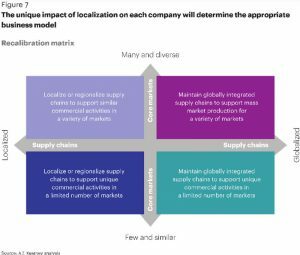 First, companies must recalibrate their global footprint based on a reassessment of core markets and a realignment of their global value chain to adapt to new localization pressures. Second, they need to develop sensory perception in each market in which they have a presence. Executives must be continuously aware of local conditions and how they are shifting, recognize the company’s role in shaping and reacting to those conditions and use that knowledge to develop business insights and strategies tailored to each local market. The report has identified five strategic questions executives can consider as they look to recalibrate their company’s global operations. Executives will answer each question in the chart below differently based on industry, geography and other variables resulting in discovering ways they can tailor their business model and compete in the multi-local market. The full Global Business Policy Council report can be found here.